Before President Obama and Washington rejoice over the newly announced decrease in the unemployment rate they need to face a harsh reality: America is still not gaining jobs. In fact, the main reason unemployment “fell” is because the workforce has shrunk. The Bureau of labor statistics reported this morning that the unemployment rate fell by 0.4% to 8.6%—what the Obama Administration would call a success. However, one key fact was left out of this report: the work force has decreased immensely since President Obama has taken office. Those who have given up looking for jobs are not included in unemployment statistics. “We lost the equivalent of the entire city of Pittsburgh, PA in the labor force last month alone. This is unacceptable,” Reince Preibus, Chairman of the Republican National Committee, announced via twitter. 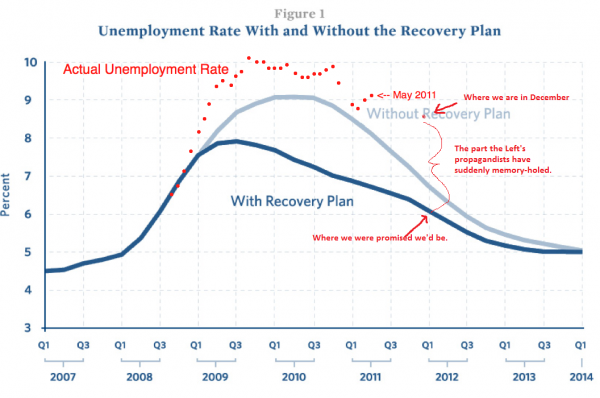 This is the tragic side of the stalled Obama “recovery”: people are losing hope. Also contributing to the decrease in the unemployment rate is the increase in demand for seasonal jobs during the holidays. “More than half the jobs added last month were by retailers, restaurants and bars, a sign that holiday hiring has kicked in,” AP reported. The BLS report claims largest job gains in the private sector came from retail trade (+50,000), professional and business services (+33,000), leisure and hospitality (+22,000), and health care (+17,000). Eleven percent unemployment would be staggering. The only reason it appears to be 8.6% is because the workforce has contracted. These latest government statistics should not fool people. The workforce has shrunk because the American people have lost faith that Washington will implement job-creating policies. The graph above shows the incompetence of the Obama Administration’s economic policies. The dark blue line is where the Obama Administration promised we would be, thanks to its massive stimulus package. The gray line is where they said we would be without the stimulus package. The red dots show where we have been—a deeply disconcerting reality. This is unacceptable, and today’s report of “falling unemployment” gives false hope to the American people. President Obama’s “Hope and Change” economic policies are not providing hope, and we certainly are not seeing change. We must not let the White House and the media skew these statistics and deliver the wrong message to America. So, if those who have simply given up looking for a job were added to the unemployment rate, then what is the actual unemployment rate right now? I feel FreedomWorks supporters are being fed a large amount of “Stinking Used Straw” from the paddocks of therecreational horse owning crowd. Progressive taxation served this country very well since Teddy Roosevelt (a rich man from a very rich family) supported it around 100 years ago. It funded America through two world wars, the “cold war”, Vietnam, Korea, the Lunar Mission and. The Tennessee Valley power programs, The development of Interstate Highways, the development of the US Airline system. Additionally, under progressive taxation, the USA Economy outgrew everything else on the planet and we still continue to dominate the world in terms of opportunity and prosperity. Moreover, it supported the USA development of the largest war machine capability ever dreamed of. Right now, we outspend the other 6,700,000,000 world citizens combined. Each American outspends 22 other persons on arms and this is more stupid when the communist block is decimated and the Chinese actually dominate us through their Walmart invasion taking our jobs and not a military threat. The argument of the tax code’s complexity is an asinine reason to adopt flat taxes when you think about the situation. Whether fact we have of 6 or 600 tax brackets is NPT any more complicated than alphabetizing your Christmas card list. THE REAL COMPLEXITY COMES FROM ALL THE LAWS WRITTEN TO evade the tax bracket assignment. Tax laws are punitive when they take money from folks and deny working people a middle class life. Warren Buffets, Bill Gates and Steve Jobs and other billionaires acknowledge they only got rich from the American Business Infrastructure that only established with various government investments. Without the space program there would be no microelectronics or internet systems and interstate transportation bave us a great leap in economic growth and good public schools positioned us to win World War II with capable soldiers, weapons and women in the factories. If low tax rates were the key to employment and prosperity, then our economy should be roaring like the 60s because higher income folks are enriched by recent generation tax changes doubling their incomes since ’75. WITH THIS HISTORICAL FACT, HOW CAN ANYBODY ARGUE THAT WE NEED TO REDUCE TAXES NOW TO CREATE JOBS? IT JUST HASN’T PROVEN OUT SINCE RONALD REAGAN AND “CONTRACT WITH AMERICA” SHIFTED THE TAXES DOWN TO LOWER INCOME PAYERS. The greatest USA wage increases came between 1947 and 1975. This is DESPITE unions, high taxes and lower military investment back then. Your hypothesis is flawed. The progressive tax that Roosevelt supported in 1914 had 16 tax brackets and a top tax rate of 16%. Today we have 5 tax brackets and a top rate that will soon be 40%. In 1914 all income earners paid federal income tax but owing to the large number of brackets the lowest wage earners paid very little, but at least they paid something. In contrast 47% of Americans now pay no federal income taxes at all, and the top bracket stops at $379K, a figure far lower than the ultra-rich citizens who Roosevelt proposed we tax. In essence the real burden of the progressive tax system now falls heavily on the middle class. The current progressive tax system is designed to buy the votes of the lower income earners while pandering to the demands of the truly rich. A progressive tax system is only just if it is indeed progressive all the way up into the very highest income brackets and not just stop at $379K, plus every American should carry at least some part of support of the wonderful achhievements that you cited in you poat. But the whole premise is mute so long as our tax revenues are progressively devoured by the interest payments on an ever increasing debt. Combine these facts with the idea that Roosevelt felt very strongly about a balanced federal budget, and the real flaw in your reasoning becomes apparent. Until the government makes a commitment to balance the budget, the "stinking straw" that you mentioned actually comes from advocates for increased taxes, since those taxes are then squandered in support of this federal spending addiction. This very tax system which you extole as being a reason for our greatness is also the very thing that will ultimately destroy us since it is far different than anything Teddy Roosevelt ever envisioned or advocated. "Those who have given up looking for jobs are not included in unemployment statistics." In more correct terms, those that have ran out of benefits are no longer counted. How would they know who has "given up looking for jobs" otherwise? State it like it is, they ran out of benefits and are now receiving nothing. IF "ALL" those people were included the true number would be 20%+ unemployed. I hope he loses the next election he hasn't done his job!!! !